It's kind of amazing that it's time for Advent already, isn't it? How does a year pass so quickly? For the past three years, I've posted Advent devotions focused on the traditional Advent words hope, love, joy and peace, but this year I want to approach the season a bit differently. For these four weeks, I want to look at the people involved in the Christmas story and look at what their part in that story can tell us about God's plan for His people, including us. We will begin this week by looking at Elizabeth. We don't know much about Elizabeth herself. Luke tells us that "In the time of Herod king of Judea there was a priest named Zechariah, who belonged to the priestly division of Abijah; his wife Elizabeth was also a descendant of Aaron. Both of them were righteous in the sight of God, observing all the Lord’s commands and decrees blamelessly. But they were childless because Elizabeth was not able to conceive, and they were both very old" (Luke 1:5-7). From this, we know that Elizabeth and her husband were good people, who lived according to God's law, and had for a long time, since we are told they are very old. We also know the most important thing about Elizabeth, which is that she could not conceive a child. At that time, and throughout all of history until recently, having a child was a woman's main goal. Being a mother was considered a woman's greatest accomplishment, while not having a child was a cause of shame. Women who can't conceive today still suffer terrible heartache, just as Elizabeth would have, longing for a child to hold in their arms. Elizabeth would have had the added burden of being considered a failure by her entire society. Can you imagine being considered a complete failure as a person for something that was entirely out of your control? How hard it must have been for Elizabeth when she got so old it was considered impossible for her to have a baby. How heartbroken she must have been to have to give up that hope. But God had a plan. He hadn't forgotten her. One day, when Elizabeth's husband Zechariah was serving in the Temple, an angel came to him and said, "Do not be afraid, Zechariah; your prayer has been heard. Your wife Elizabeth will bear you a son, and you are to call him John. He will be a joy and delight to you, and many will rejoice because of his birth, for he will be great in the sight of the Lord. He is never to take wine or other fermented drink, and he will be filled with the Holy Spirit even before he is born. He will bring back many of the people of Israel to the Lord their God. And he will go on before the Lord, in the spirit and power of Elijah, to turn the hearts of the parents to their children and the disobedient to the wisdom of the righteous—to make ready a people prepared for the Lord" (vv. 13-17). What was Elizabeth's response, after she finally became pregnant? "The Lord has done this for me,” she said. “In these days he has shown his favor and taken away my disgrace among the people" (v. 25). Can you feel her relief, her sense of vindication from the judgement of the people who thought her barrenness a sign of God's disapproval? Not only was God not disapproving of her, He had chosen her for something special. She was to carry the child who would go before Jesus, getting people ready for Him. So, what does Elizabeth's story mean for us? Well, when we want something really badly, we want it right away. Like, yesterday, right? But sometimes God's plan is for us to wait. And wait. And sometimes we have to wait even longer. God didn't make Elizabeth wait until old age to have a baby to be mean to her. He had her wait until then because that was the right time for her part in His plan. That was when everything was set for Jesus to be born, which meant that Elizabeth's very special child needed to be born then too. He would get the people thinking about God again, get them ready to hear Jesus' message about the kingdom of Heaven. And being an old woman, past the age of childbearing, made it obvious that God had done exactly what the angel told Zechariah would happen. Had they been young, Zechariah and Elizabeth might have doubted that their child truly came from God. They might not have bothered to follow the rules God laid out for John, or maybe they wouldn't have taught him about the special job God had planned for him. But because they were so old, Zechariah and Elizabeth had no doubt that their child had been given to them by God, exactly as the angel explained would happen. Only God could have made it possible for Elizabeth's body to bear a child at her age. We don't like waiting, especially if we can't see any good reason why we can't have what we want now. 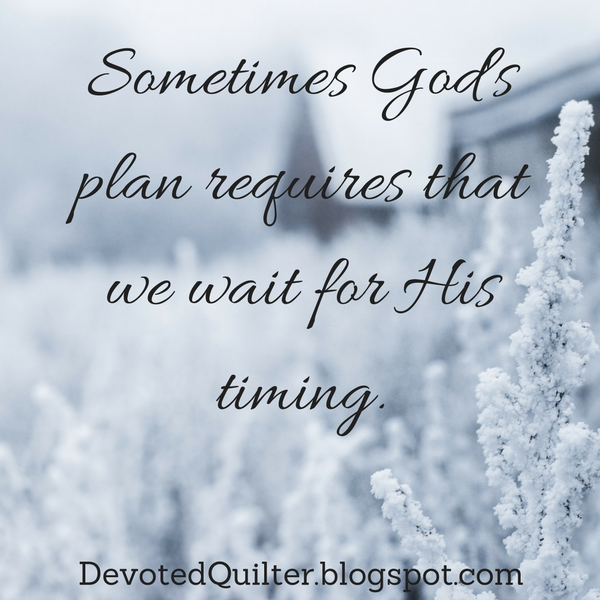 Sometimes, though, God's plan requires that we wait for His timing. I think July's block, Lady Liberty, may be my favourite of the entire year. I just love those crisp points and the stars. 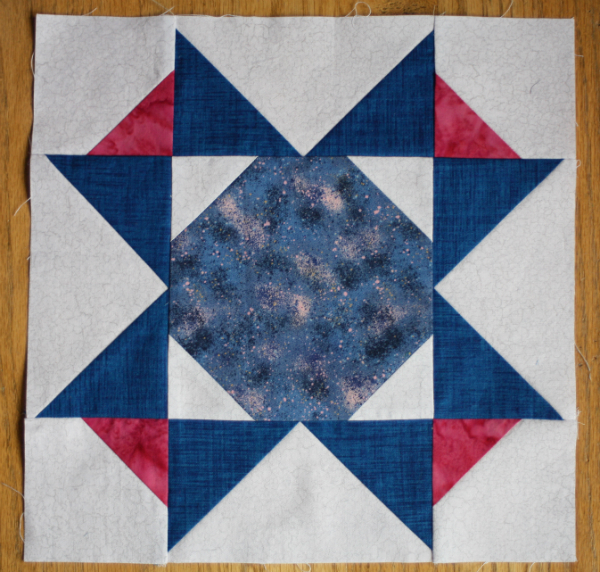 And August's block, Shenandoah, is another beautiful star. I love the simplicity of this block. 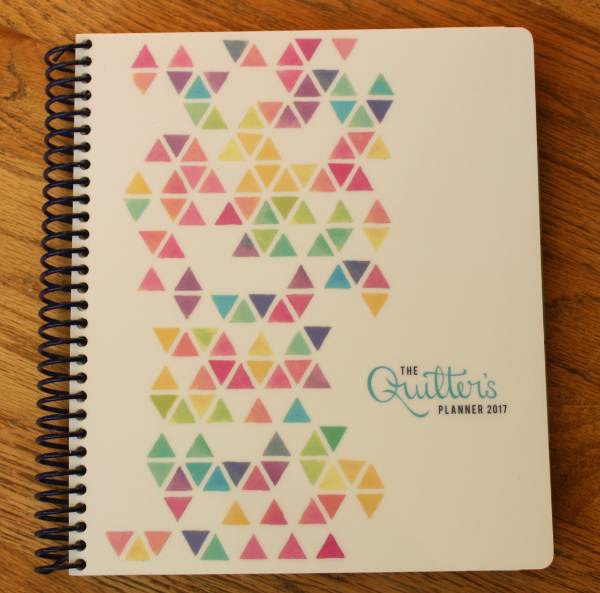 In other news, I got my 2017 Quilter's Planner on Monday! 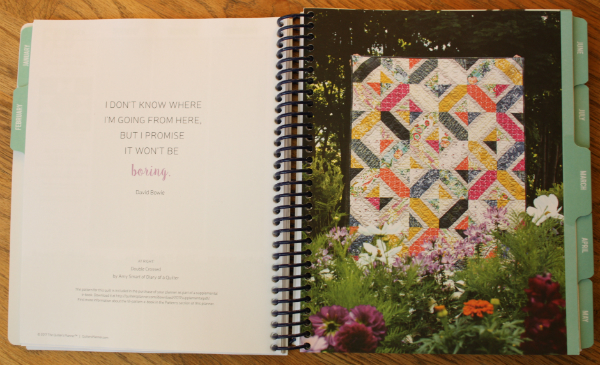 I've enjoyed flipping through it and reading the quotes about creativity and art, looking at the gorgeous quilts and checking out the weekly blocks. Now I feel like I can start making plans for next year, lol. 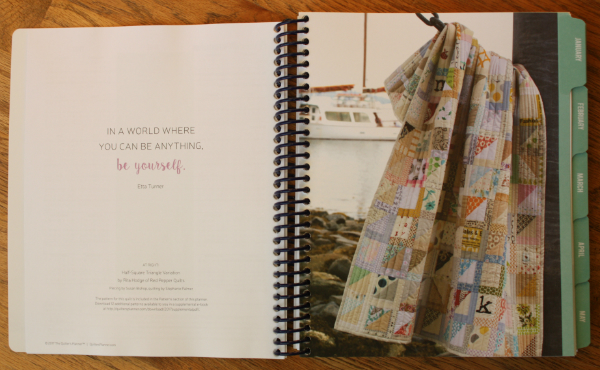 If you want a copy for yourself, visit Stephanie at Late Night Quilter to get all the details. I've combined 4 of my mini quilt patterns into one bundle, so if you're stuck on what to make for a couple of special people, you're sure to find the perfect patterns here. 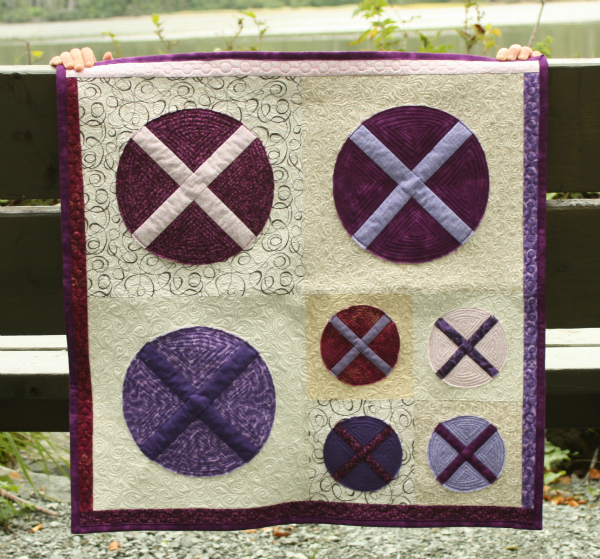 The Mini Quilt Pattern Bundle includes X Marks the Spot, which finishes at 26" x 26" and features circles made with machine applique. 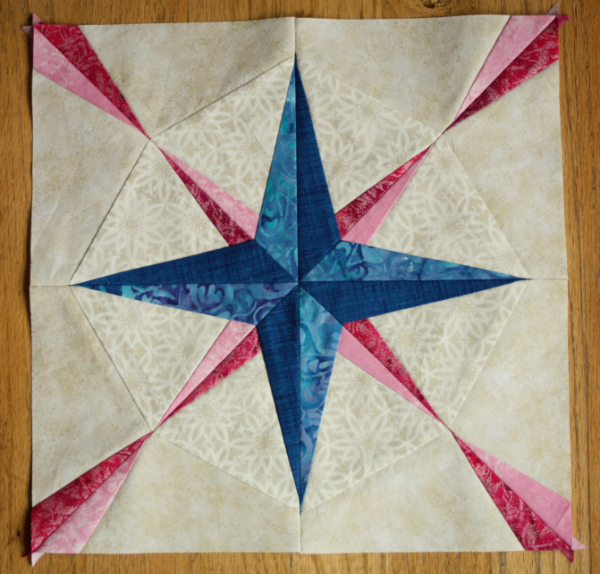 Twirling Star finishes at 19 1/2" x 19 1/2" and is made with traditional piecing and foundation paper piecing. Flower Box finishes at 24" x 24" and uses traditional piecing and machine applique. 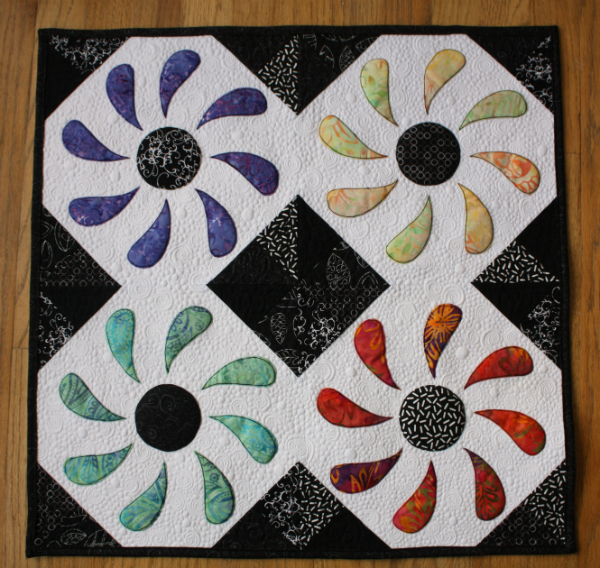 As you can see, there's lots of room around the flowers for fun free motion quilting. The pattern also includes instructions for finishing one block as a cushion. The fourth pattern in the bundle is my Friendship Galaxy baby quilt pattern, which includes four different size options. 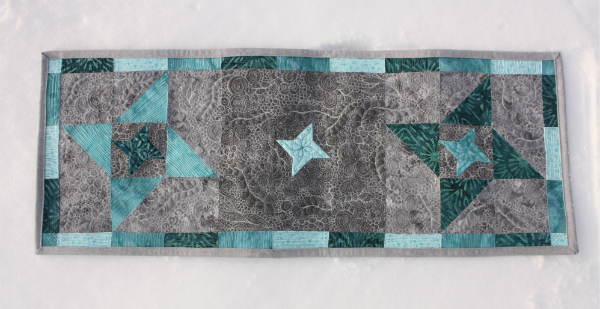 This skinny mini, which would be great as a table runner or as a wall quilt, is one of two mini quilt layouts. 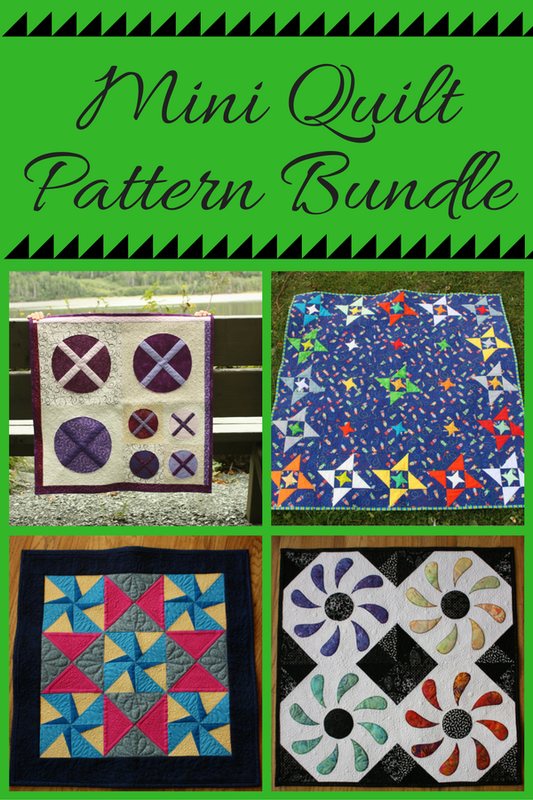 Get your Mini Quilt Pattern Bundle in my Etsy and Payhip shops for $21. That's all 4 patterns for the price of 3! There are some quilters who want to paper-piece all of their projects and others who hand piece everything. There are some who only do traditional piecing...no paper piecing, no applique and no hand stitching at all. There are even people who only make quilt tops, but always send them out for others to do the quilting. Me, I want to do a little bit of everything! I have made little forays into garment sewing in the last couple of years and I'm working hard at not allowing myself to take up knitting. I see so many gorgeous knitting projects that I really want to try, but I keep telling myself that I already don't have enough time for all the quilts I want to make and I don't need to add a whole new obsession to the list of things I'm trying to make time for! I think I'd get bored if everything I made had to be done with the same techniques. I enjoy mixing it up...a little traditional piecing, a little hand stitching, a bit of paper piecing and embroidery here and there too, with lots of intricate machine quilting. What about you? 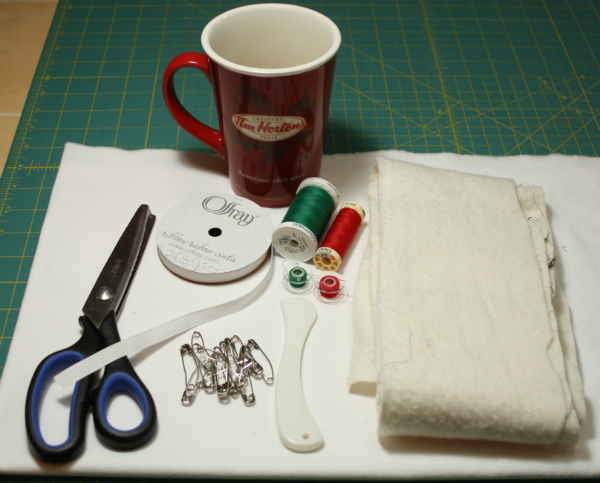 Do you divide your sewing/crafting time between lots of different things, or do you keep it all fairly streamlined? Dividing time between many things is fine when it comes to our hobbies, but not so much when it comes to our worship. The psalmist wrote, "Teach me your way, Lord, that I may rely on your faithfulness; give me an undivided heart, that I may fear your name. I will praise you, Lord my God, with all my heart; I will glorify your name forever. For great is your love toward me; you have delivered me from the depths, from the realm of the dead" (Psalm 86:11-13). Here, the undivided heart isn't talking about our interests or our hobbies, but rather about our hearts being solely focused on God. About turning to Him alone as the object of our worship. This has been a hard thing for people to get right. Joshua had to deal with it while he was leader of the Israelites, finally telling them, "But if serving the Lord seems undesirable to you, then choose for yourselves this day whom you will serve, whether the gods your ancestors served beyond the Euphrates, or the gods of the Amorites, in whose land you are living. But as for me and my household, we will serve the Lord" (Joshua 24:15). Then there was Elijah, who told the people, "How long will you waver between two opinions? If the Lord is God, follow him; but if Baal is God, follow him" (1 Kings 18:21). Of course, this was no surprise to God, who included as His first two commandments, "You shall have no other gods before me. You shall not make for yourself an image in the form of anything in heaven above or on the earth beneath or in the waters below. You shall not bow down to them or worship them" (Exodus 20:3-5). And, in case we should feel that this was only an Old Testament problem, one we are not susceptible to since we are not in the habit of setting up false gods for ourselves, Jesus said, "No one can serve two masters. Either you will hate the one and love the other, or you will be devoted to the one and despise the other. You cannot serve both God and money" (Matthew 6:24). No one sets money, or anything else, on an actual altar and proceeds to hold a worship service in honour of it. But there is no question that we often have our hearts focused on things rather than on God. Not that there is anything wrong with things. 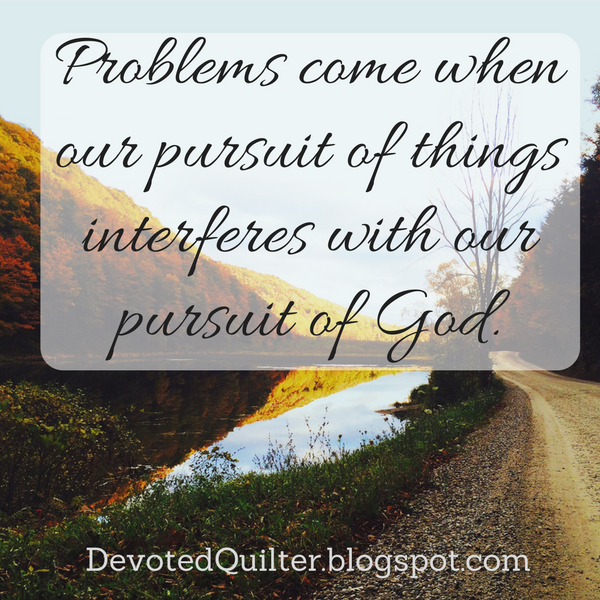 The problems come when our pursuit of those things interferes with our pursuit of God. And it's not always physical things. Sometimes we pursue approval from people, or influence with someone or success, however we may define that in a given situation. They may not be physical things we can hold in our hands, but they are certainly things that can take precedence in our lives if we're not careful. Jesus told us the greatest commandment is for us to "Love the Lord your God with all your heart and with all your soul and with all your mind" (Matthew 22:37). All your heart. All your soul. All your mind. 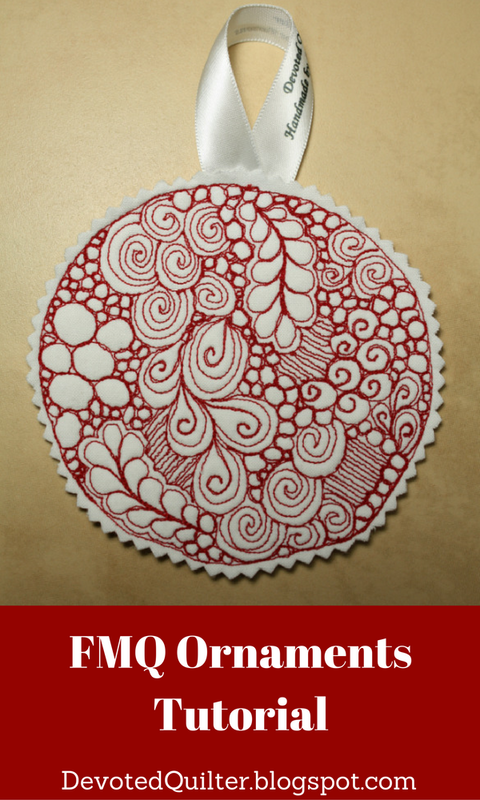 But, finally, here is a tutorial for these fantastic free motion quilted ornaments! 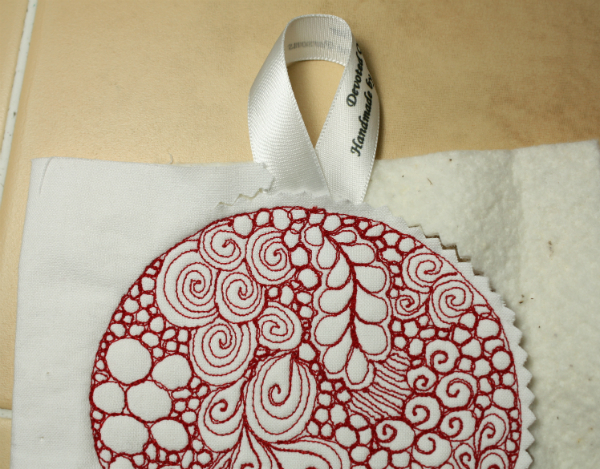 * Fabric for the front and back of the ornaments, slightly larger than your finished ornaments will be. I recommend solid fabric to allow your quilting to shine. 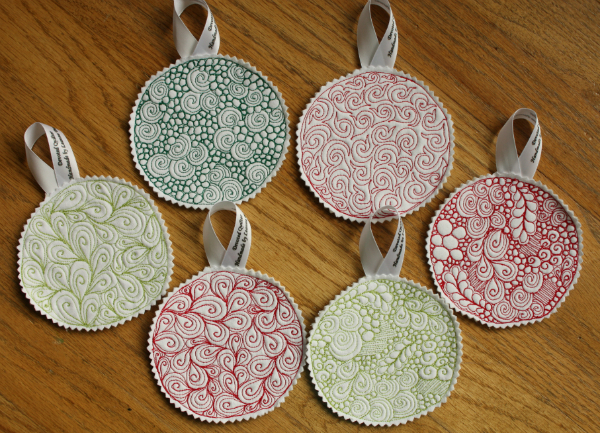 I'm using white yardage for my ornaments, but you could easily make them from scraps in any colour you want. * Something to create the circle outline. I used the rim of a mug, but you can use anything you have that is the size you want. I wanted mine to be pretty big (as ornaments go), to allow for lots of quilting. Of course, your ornaments don't have to be circles, so play around and use whatever shape you want. * A hera marker or removable fabric marker. 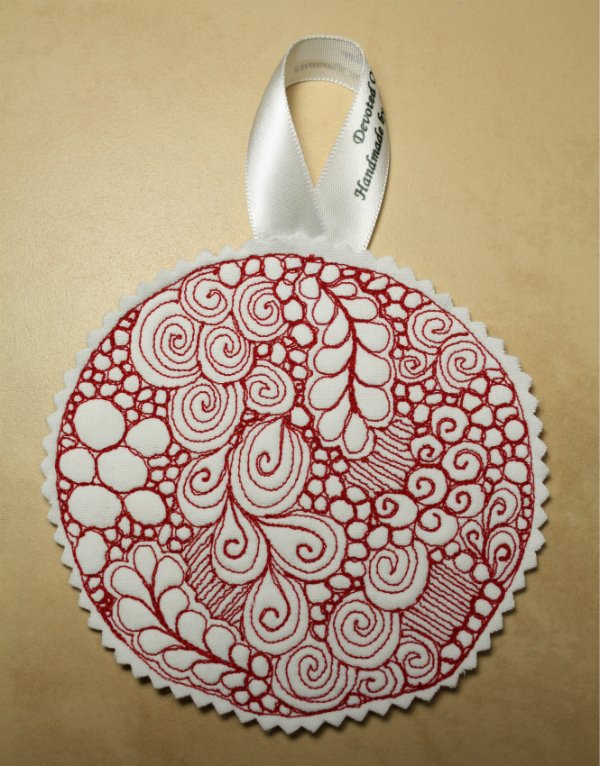 You'll use this to draw the outline of your ornament, so you want to be sure the line will disappear. If you'll be mailing your ornaments, I don't recommend a Frixion pen as their ink tends to reappear if exposed to cold temperatures. *Ribbon for hanging the ornament. I'm using my quilt labels, but any fabric ribbon will work. * Scraps of batting slightly larger than your finished ornaments will be. * Thread. This is where you can have a lot of fun playing around. 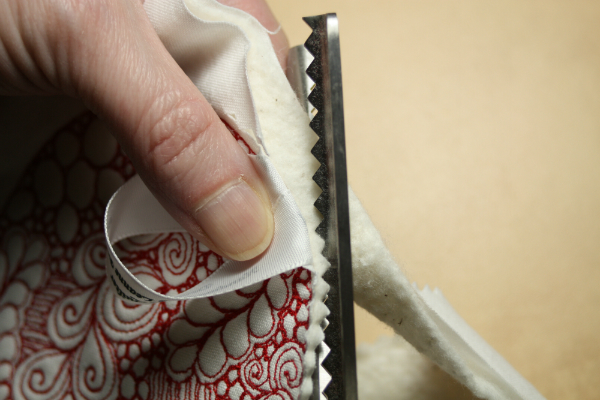 Use thread to match your fabric if you want only the texture of the quilting to show, or use thread that contrasts to allow the quilting to take center stage. Use red and green for a traditional Christmas look, or go wild with whatever colour appeals to you. Layer your fabric and batting just as you would if you were basting a quilt. 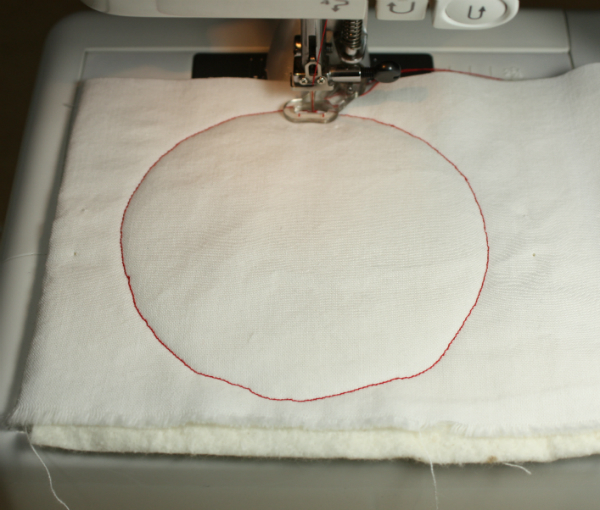 Use the hera marker to trace the outline of the circle onto the fabric. My camera really struggled to take pictures of all this white! 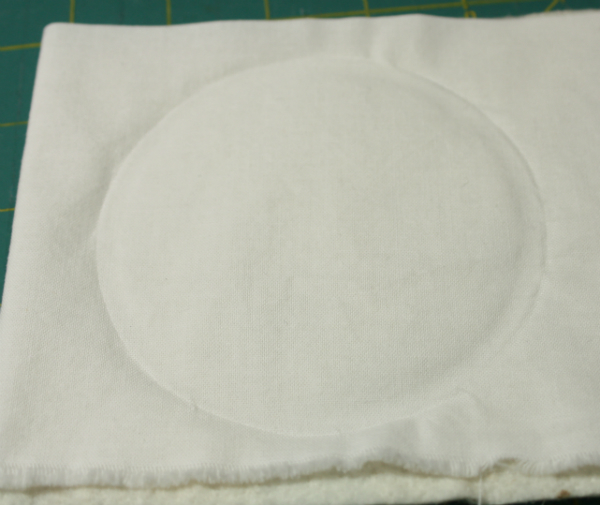 Cut your ribbon to size and place it between the top fabric and the batting, with the ends extending at least 1/4" inside the drawn circle. Pin in place. Pin in a couple of places to hold all the layers together. Because I'm using yardage, I have my fabric cut into strips and circles drawn along the length of the strip. Now quilt along the drawn line to outline the ornament. Try to keep the outline neat, but don't stress about little wobbles in the line. They will be much less noticeable when the whole ornament is filled in. 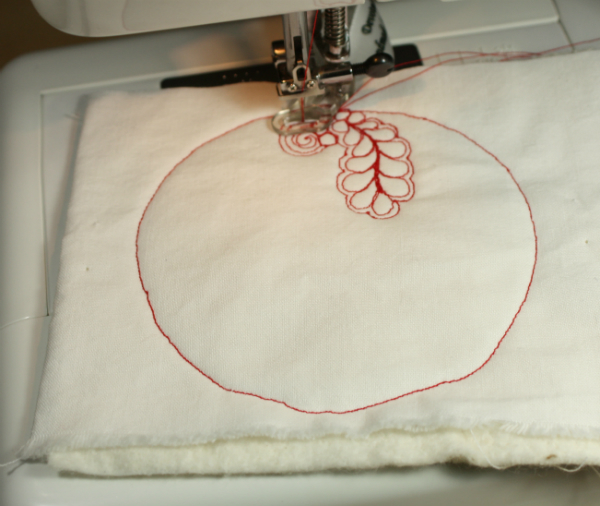 Yes, using the red thread on white fabric is scary, especially when there's only a bit of stitching done. Wobbles seem especially glaring when there's so much contrast! Once the whole ornament is finished, the red feels much less stark. Then start quilting! 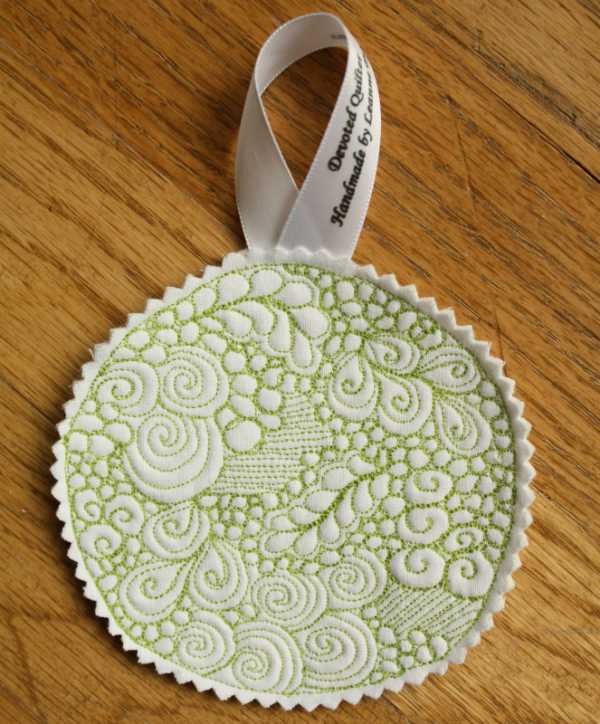 I used flow quilting for this ornament, but you could do anything you want. What motifs are you comfortable with? Pebbles? Swirls? 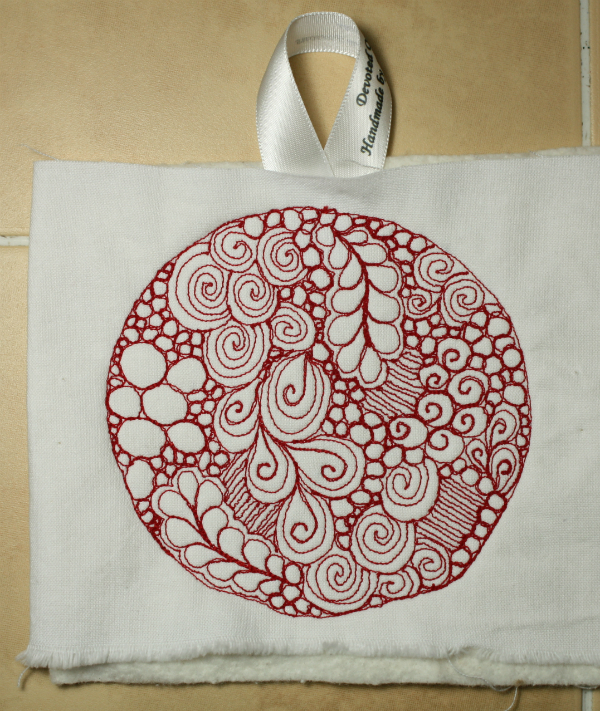 Whatever it is, you could fill your ornament with beautiful free motion quilting. Plus, since the ornaments are small, you could use them for practice. Now it's time to trim it using the pinking shears. Leave a few threads to the outside of the stitched line. When you come to the ribbon, you'll need to separate the layers so that you don't cut the ribbon. 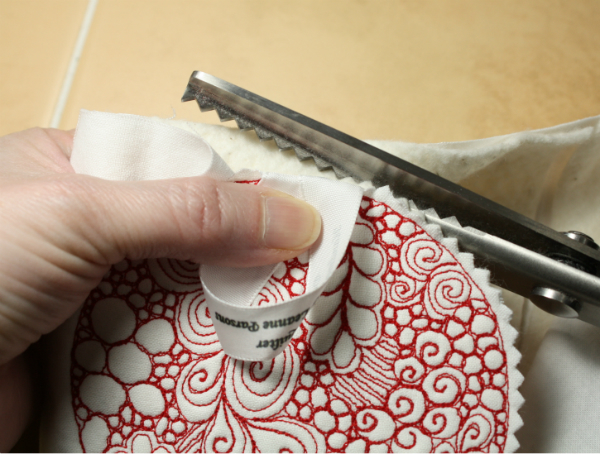 Start by pulling the top fabric away from the ribbon and trim that. 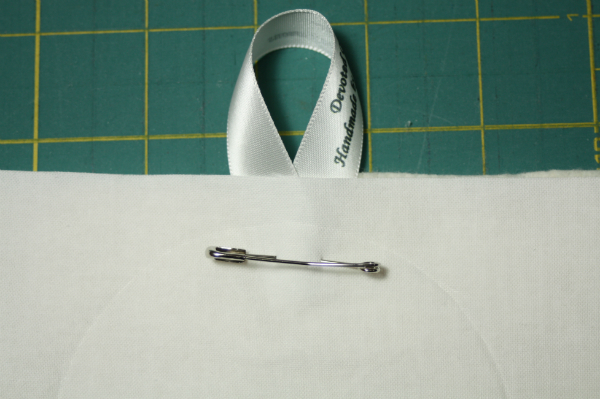 Then pull the ribbon to the front and trim the batting and backing. Once you are past the ribbon, continue trimming all three layers together the rest of the way around the circle. And that's it! Simple, isn't it? 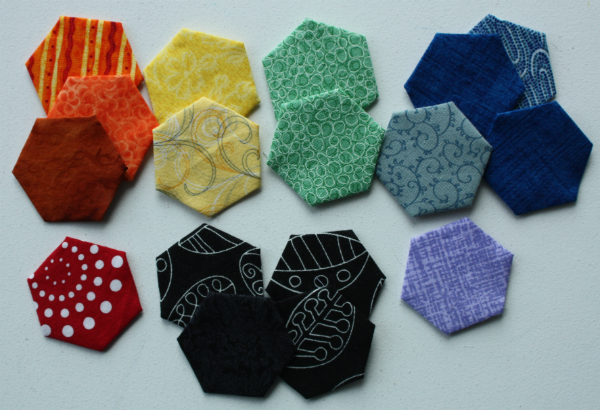 So far I've made 6 and I'm having a lot of fun playing with different quilting motifs. I plan to make about a dozen more, if possible. If you make ornaments using this tutorial, I'd love to see them! Leave me a link to a blog post in the comments or email a link or a picture to devotedquilter at gmail dot com. Or you can tag me (@devotedquilter) on Instagram. Nathan, in grade 3, still has spelling words each week with a test on Friday. He really prefers it when the words for the week are easy and he doesn't have to work very hard to learn them. If he knows them already, that's even better! The weeks that he doesn't know the words already and they're not easy to learn, we sometimes have small battles over whether or not he can do it. I've tried explaining that the whole point of spelling words and tests is that it pushes students to learn something new and grow their minds, but he still doesn't like struggling through the list each evening. Can you relate? I know I can. Maybe not with learning something new, since I kind of enjoy that, but I certainly don't like it when I'm dealing with something in life that is hard. In the grand scheme of things, spelling words are one of the smallest hard things a person will deal with. There are so many in life that are so much bigger, from health challenges to financial trouble and family conflicts. Problems at work and children making choices contrary to what they've been taught is right...the list goes on and on and on. Wouldn't it be better if life was always easy? Wouldn't it be better if we already knew all the answers? Unfortunately, no. While we may like the thought of taking the easy road through everything and never needing to struggle to overcome a challenge, the Bible teaches us that those struggles and hard times are actually good for us. Romans 5:3,4 says, "Not only so, but we also glory in our sufferings, because we know that suffering produces perseverance; perseverance, character; and character, hope." Life might feel better in the moment if we never have to deal with hard things, but you can be sure our growth would be stunted if that were the case. Think about it...Nathan's literacy won't grow unless he works hard at learning to recognize and spell harder and harder words. We understand that it's necessary for kids to work at their schooling because we know that their knowledge and understanding need to grow. Well, it's the same for us adults, but it's our spiritual understanding and knowledge that need to grow. Let's look at the three things Paul says are produced in us through dealing with hard times. Perseverance is continuing to do something even when it's hard, or when you're not seeing results as quickly as you would like. It's not giving up, not quitting as soon as you encounter trouble. Isn't that a trait we all want in our lives? None of us intend to turn away from God at the first sign of difficult days, but that is exactly what happens to some people, because they fail to cling to Him through those hard times. They lack perseverance. And yet, the only way to grow perseverance is to deal with things that are hard, things that require you to continue on in faith despite the hardships and difficulty. Then we come to character. In this verse, the implication is that this is approved character, tested and shown to be of worth. This character only comes through perseverance, by continuing on through tough times and not giving up at the first hint of trouble. And lastly, the word translated as hope, elpis, means 'expectation of what is sure.' I think of it as an understanding of God's steadfastness, of his sure-ness. In the midst of a world that is changing and sometimes difficult, God is always present, always in control and always on our side. Understanding that is a sign of spiritual maturity, but, again, it only comes through dealing with things that are hard. 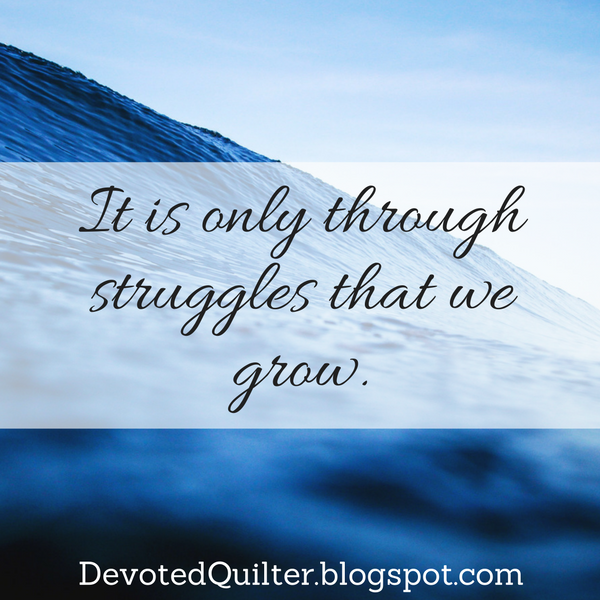 While we may want to live lives of ease all the time, it is only through struggles and difficulties that we grow. 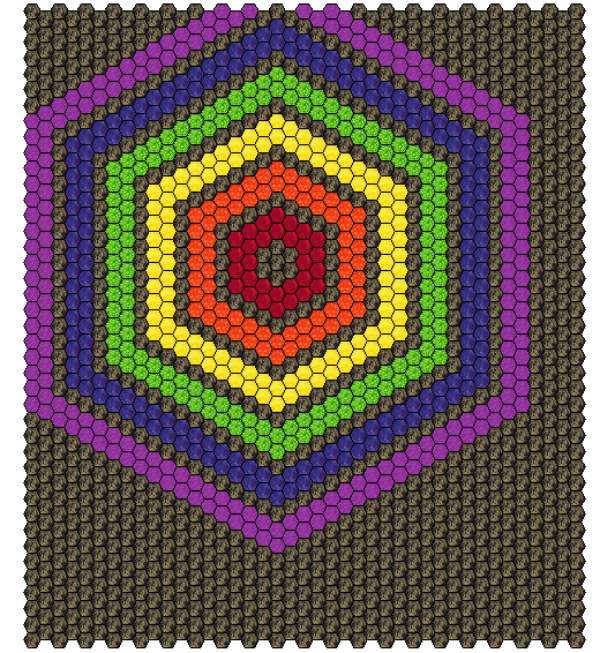 Remember this quilt design from a few weeks ago? Well, I knew as soon as I finished designing it that I would want to make it, but I waited until I had my Sew Together Bag to actually start. With the Sew Together Bag I have enough compartments that I can keep the hexies and stars separate as I work on them both. I'm still mostly working on my Scattered Stars, but I'll baste hexies whenever I'm making a star out of a fabric that will fit my Rainbow Hexies quilt. And how many hexies do I need? 1 161. I know, crazy, right? But I'm really in no hurry and I enjoy basting the hexies, so for now I'll just keep basting them and setting them aside. 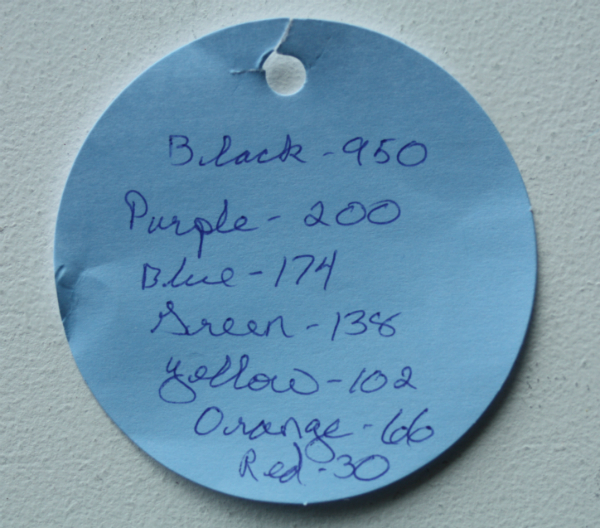 To keep track of how many I need of each colour, I have a little cheat sheet in my bag along with my basting supplies. Let's see...I have 1 red, 3 orange, 2 yellow, 2 green, 4 blue, 1 purple and 4 black, for a grand total of 17. So, roughly 1/100th of the total, lol! Good thing I'm not in a hurry! 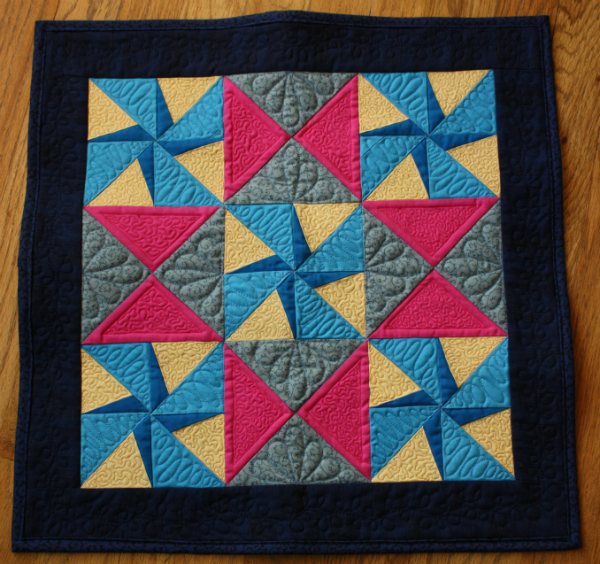 When was the last time you started a project you knew would take a looooong time, quilting or otherwise? Over the past couple of years, I've had a handful of times when I was sick over the weekend. Usually my weekends are jam-packed with things I need to do (house cleaning, groceries, etc.) and things I want to do (sewing, usually! ), but on those weekends I've been sick I end up just sitting in a chair and accomplishing nothing. It drives me crazy! I feel like I have this huge list of things I should be or want to be doing and I can't do any of it. It feels like such a huge waste of time. There's a brief story in the gospels about Jesus healing Peter's mother-in-law...well, at this point Peter was still called Simon, so that's what he's called in these verses, but I'll be referring to him as Peter :) Luke records it this way: "Jesus left the synagogue and went to the home of Simon. Now Simon’s mother-in-law was suffering from a high fever, and they asked Jesus to help her. So he bent over her and rebuked the fever, and it left her. She got up at once and began to wait on them" (Luke 4:38,39). That last sentence used to annoy me a bit. It felt like they only want her healed so she could get them something to eat. Isn't it funny how our minds interpret things, sometimes? Now that I'm older, though, I read that last sentence through the lens of those sick, unproductive weekends. This poor woman had been sick with a high fever for who knows how long. She was stuck in bed, unable to do anything. Like me, she probably had a list in her head of things that needed to be done to keep her household running smoothly, and it was likely a lot longer than mine since she didn't have all the modern conveniences that I have. When I finally get over a cold, the last thing I want to do is just sit and relax. There is stuff that needs to be done and I can't wait to get at it. I imagine Peter's mother-in-law felt the same way as she got out of that bed. Of course, when she was healed of her fever, she had company. What's the first thing we do when we have company? Offer food and a drink, right? That's exactly what she did, and I think she was relieved to be finally well enough to serve Jesus and her other visitors. She had been set free of the fever to finally get stuff done again! So what about us? Whether or not we have been physically sick lately, we were all spiritually sick at one point and Jesus healed us by offering us forgiveness of our sins. By faith in Jesus, we have been healed and set free from sin. I think that, like Peter's mother-in-law, the best response to that healing is to get to work and serve Jesus. 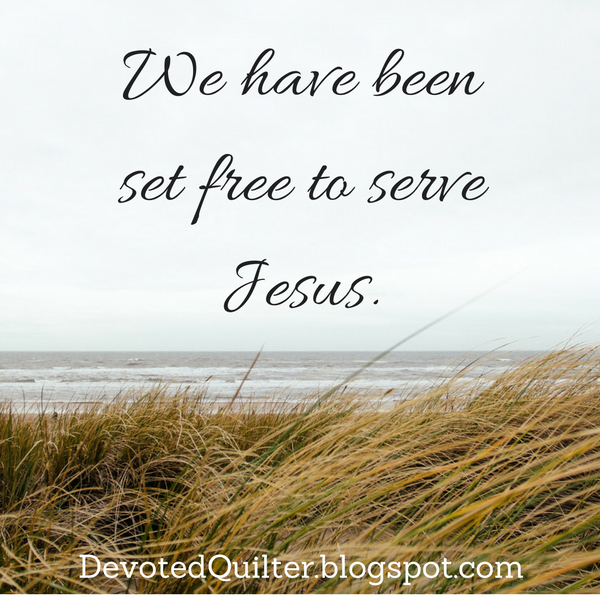 Which begs the question, how do we serve Jesus? Is it only when we're doing church things? I don't think that's right at all. God made each one of us differently, with different talents and abilities. Read 1 Corinthians 12, where Paul compares the church to a body, where every part is needed because all of the parts are different. Not all of us can be preachers. Not all of us can be musicians (which you would know for sure if you ever heard me sing!). And not all of us can be children's church teachers. Some people are excellent business people, or good cooks, or good quilters! God can use all of those skills if we decide in our hearts that we are working for Him. Colossians 3:17 says, "And whatever you do, whether in word or deed, do it all in the name of the Lord Jesus, giving thanks to God the Father through him." 'Whatever'. That's a big word, isn't it? It means everything we do can be done in service to God, if we have the right attitude while we're doing it. And the right attitude is even described in the verse for us...'giving thanks to God the Father through him (Jesus)'. So, because of what Jesus has done for us (offering us spiritual healing and forgiveness of our sins), we are to be thankful to God, and we show that thankfulness by serving Him with everything that we do. We have been set free to serve Him, just as Peter's mother-in-law was. She served him with food and drink. We serve him with everything we do. It's finally time to release my Snow Friends pattern! 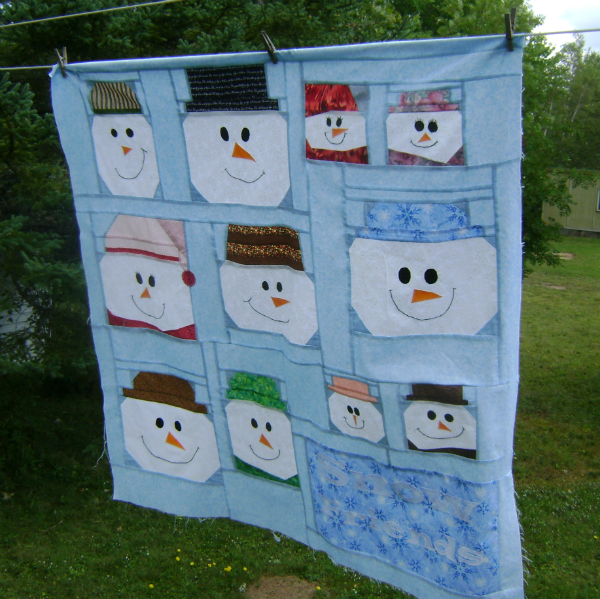 This pattern makes a 48" x 48" wall hanging, using traditional piecing, machine applique and a little hand embroidery. All of the individual blocks could also be used separately for many other projects. Think table runner, mini quilt or bag. 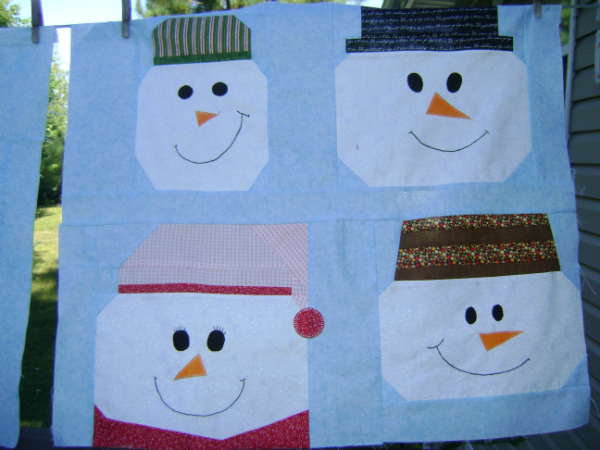 With 11 different snowmen and snow women, there are so many possible ways to use this pattern! 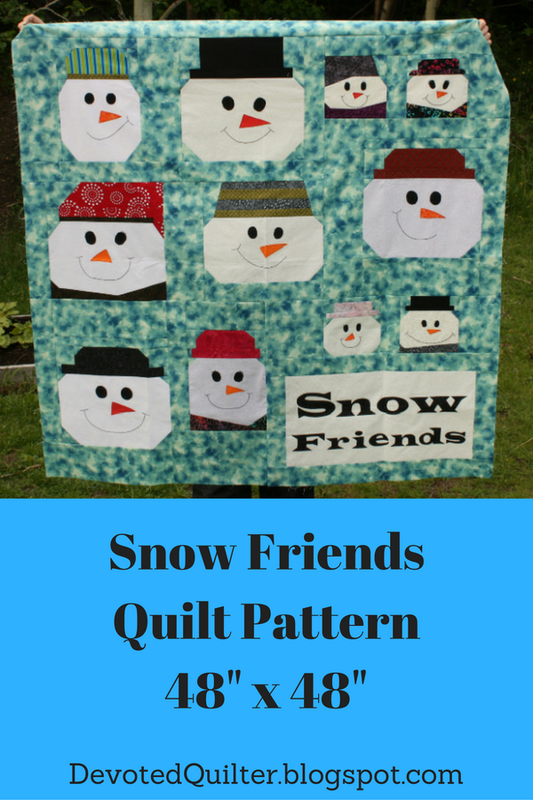 I had two generous pattern testers who made beautiful versions of Snow Friends. First up is Tish, who blogs at Tish in Wonderland. This is what her quilt looked like when she basted it, but you can see the finished quilt in this post. Then we have Frances, who blogs at Tea Time Creations. Frances sent some great in progress pictures as well as a picture of her finished top. I love the pompom she added to the snow woman's pink hat! And her finished top. Don't the snow friends look adorable? 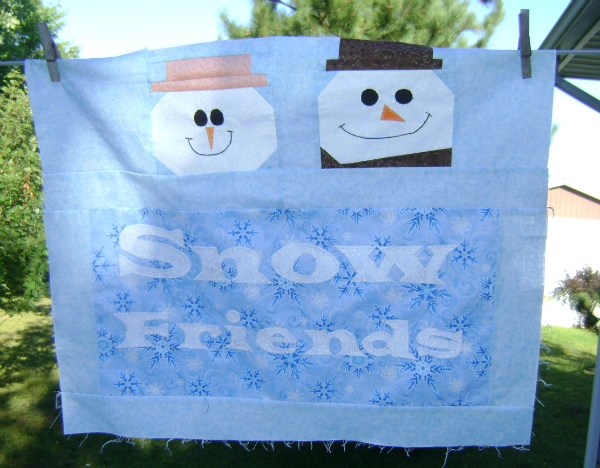 Snow Friends is now available in my Payhip and Etsy shops. There's still time before the holidays to stitch up some new friends! I'm linking up this week with Let's Bee Social, NTT, Can I Get a Whoop Whoop, TGIFF and Finish it up Friday.